In the town where I live, October is a month of preparation. When November arrives, we celebrate this season with crushed flowers and papier-mache and painted skulls made of meringue powder and sugar. We design arches and ofrendas that decorate the placita. We cut flags from candy-colored paper to drape from our doors and windows, over our streets. My husband and I eat mini-Snickers and sour gummies and cookies spicy with ginger and piloncillo. We invite the dead to come, to step into the light and be remembered. We tell them they are welcome. I did not grow up with these traditions. I married into them. As a child, I attended a school where the word Halloween was toxic and dangerous. Instead, they hosted harvest parties and fall festivals advertised with flyers that said, "No scary or violent costumes." They said, "Bible characters recommended," as if Biblical heroes were never scary or violent, as if Samson or King David didn't kill more people than Jason or Freddy ever could. They said, "No ghosts or ghouls," as if to acknowledge that the dead might be anything but dead was to relinquish some kind of control and safety, to allow fear free reign of the house. Maybe the intentions were good — to foster a kind of peace and comfort by holding fear at a distance, by postponing difficult conversations about death and loss and things unknown. But, the line between help and harm is not necessarily clear or uncomplicated, and what actually happened is that other monsters were created — monsters of shame and doubt and judgment that would live to be fought again and again, far longer than any ghost. Here's something I've found to be true since then: Fear that is pushed away and bound up and ignored only grows larger and more agile. It leaks out of its bonds in nightmares and anxiety. It grows new heads and take new shapes. Maybe that's why I found something healing about my life in this town with my husband and our community, where the ones we have lost are celebrated and loved and remembered. Where we don't hold fear or grief at a distance, but look them in the eye and say, "welcome." Where we acknowledge the things that haunt us and the ways we give them power. We practice these things and find something true in this season and all that is swirled up inside it — loss, mourning, celebration, disguise, remembrance, and the things we've had to lay down and watch float across the river. About all the ways they can return. I think that's what each of these books has in common — they aren't afraid of fear. They aren't afraid to hold things that are painful and vulnerable and precious in their hands to be seen and handled with care. They aren't afraid to acknowledge that there are things to battle, that there are monsters, both real and imagined, but we are equipped for the fight. And most importantly, we don't have to fight alone. "I’ve seen most of what there is to be afraid of in this world, and to tell you the truth, the worst of them are the ones that make you afraid in the light. The things that your eyes see plainly and can’t forget are worse than huddled black figures left to the imagination. Imagination has a poor memory; it slinks away and goes blurry. Eyes remember for much longer." There are a lot of YA ghost stories out there, but this one is my favorite. Kendare Blake's writing is smooth, graceful and accessible even when it's navigating richly textured ground. I love the way this story has something to say about fear and friendship, about the complexity of vengeance, and about the way people can be both adversaries and allies at the same time. When I went into my copy of When the Moon was Ours to find a favorite quote for this post, I paged through and realized I could pull almost any sentence from any page and it would stand easily, fiercely, poetically on its own. When the Moon Was Ours re-imagines the legend of La Llorona, and as per usual with Anna-Marie McLemore, it tells a story that is intimate, intricate and gorgeous, but more than that, it’s a story told with compassion and grace – two things that I value highly in the books I read, and try to cultivate in the stories I write. What I'm saying is, this book is goals. All the goals. Zoraida Cordova's writing is sensory and lovely, and she constructs her story with both boldness and precision, but my favorite thing about it is this: In the books I read when I was younger, the heroes that were broken and beaten down only to rise from ashes were hardly ever girls. Saviors were almost always boys. I used to wish for a book like this. A book with a quest full of danger and obstacles, where mistakes are made and overcome. A book that handled faith and belief as a living, breathing, evolving part of life, not as something ridiculous or disdainful. A book whose hero was a girl. "But wasn't that what every girl dreamed? That she'd wake and find herself a princess? Or blessed with magical powers and a grand destiny? Maybe there were people who lived those lives. Maybe this girl was one of them. But what about the rest of us? What about the nobodies and the nothings, the invisible girls? We learn to hold our heads as if we wear crowns. We learn to wring magic from the ordinary. That was how you survived when you weren't chosen, when there was no royal blood in your veins. When the world owed you nothing, you demanded something of it anyway." 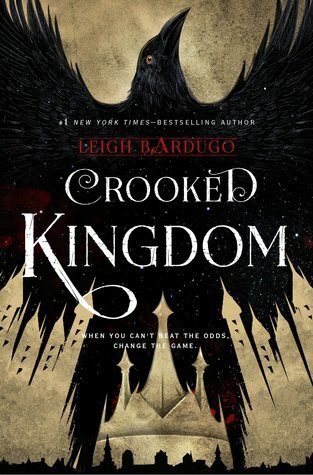 There's a lot to love about this book: Leigh Bardugo's enviable craft, building worlds and characters that feel both fantastic and deeply close, and the way the louder moments of action and the softer, quiet moments feel somehow equally important. But, my favorite thing is how well it draws the inherent paradox of loving — that while love makes us more vulnerable, it also arms us. It gives us more to fear, but also makes us fearless. April 1st is my best day. It's a day for surprises and good things. A day that's lucky. Twelve years ago on this day, I went on my first date with Javi. We went to the park and ate ice cream bars with thin chocolate shells and sprinkles that were chalky and sweet. We rowed around a lake in a boat even though Javi couldn't swim and neither of us had ever manned any sort of sea-going vessel in our lives. When we finished our ice cream, there were fortunes printed on the popsicle sticks. I don't remember if they came true. Seven years ago today, we won the ticket lottery to sit on the front row for the revival of West Side Story on Broadway. When the actors started to sing, Javi leaned over to me in the dark. "They speak to each other in English and Spanish," he said. "They're like us." Five years ago today, we got married in Javi's hometown. I carried a book instead of a bouquet and Javi cut hearts and birds and the word 'love' into papel picado that we hung in the trees. We said our vows while Popocatépetl - the volcano that Javi grew up watching from his window - blew smoke in the distance. Our friends said it was good luck. One year ago today, we found out Kobe was coming. My Kobe. Someday you will be able to read this and there's something I want you to know. I hope that as you grow up, you are a person of faith, whatever you decide that looks like for you. I hope that you believe in things outside of yourself - things like goodness and grace - things you can't see, but find evidence of in the world around you. It's okay if that faith looks different than mine or your dad's. Someday, someone might tell you that you can't believe in both God and luck, but I think they're wrong. This world is a place of complexity and contradiction. Sometimes things that seem to be opposites can both be true. I have called you mine because we belong to each other, but also you belong to no one but yourself. I am a girl and you are a boy, and yet, for a while we shared one body. You are a citizen of a country that you've never seen, and a citizen of one that you open your eyes to every day. It is possible to hold things - like the truth and a vision of what your life will be - with both a determined grasp and an open hand. It's okay to believe that you are guided by love and grace, and that a single prayer can stand against the world's worst, most fearful things, and also believe in lucky days that don't come for any reason. They just come. I once dated this guy who said he hated the concept of favorites. He said trying to choose one favorite song or book or ice cream flavor was too hard, too much pressure, and usually not even true since our tastes ebb and flow and our enthusiasm for different music or style or food changes from season to season. The thing is, he's right. Sometimes favorites can stick and become constant and defining (see: my lifelong love affair with Sesame Street), but other times favorites are shifting and changeable, like the time when I was ten years old and I spent a solid month listening to nothing but a cassette tape of Cher's Love Hurts over and over again. But, whether whim or constant, the fact remains that I am a collector of favorites - both mine and others - because I think Salman Rushdie is right about books and more broadly, about all our loved things: they make us feel more like us. Now that we're solidly into 2016, I'm writing a little roundup of my own 2015 favorites here for two reasons: 1) I've discovered many of my own most loved things by watching or reading about the favorites of others, so it seems like the right thing to participate in the practice myself. And 2) I love the idea of being able to look back and see a little polaroid of the things that made me feel like me last year, which was a year filled with lots of change and transition, grounding and settling and digging in. Johnnyswim Diamonds. I'm not afraid to commit fully and say that this is my favorite album of 2015. I actually feel like I owe quite a bit to this husband and wife duo and their soulful sounds for fueling momentum into my work days and adding calm to my downtime. So, thanks Johnnyswim, for all that gorgeous vocal sexiness. I appreciate it so much. (P.S. Their live album, recorded at my beloved Rockwood Music Hall in New York City, comes out TODAY and it is giving me life. Get yourself some of that). Ana Tijoux Vengo. To be fair, this one extends back a bit further to 2014, but it was still in heavy rotation during my writing days last year (and now), so I think it belongs on this list. It's hard to find a concise way to describe all the good things to be found at the Ana Tijoux party of awesome, so I'll just say this: Vengo is layered and rhythmic and it doesn't pull any punches. If you haven't listened to it all the way through, you should do so immediately. Host: "What kind of detective are you? Are you kind of like a Nancy Drew or are you like a Philip Marlowe? Are you a Sam Spade?" SK: "I'm very rumpled. I have a dog. And Columbo's whole thing was that he, like, asked a lot of questions...you're always like, there he is asking another question about my life. And that's what I do, too." So. If that answer also intrigues you, this amateur sleuthing podcast is probably your kind of fun. For me, Mystery Show hits a real sweet spot that's been lacking in my podcast roster: light-hearted, but enough substance to not feel mindless. I have a few pure-silly-fun comedy podcasts in my subscriptions, but the truth is, sometimes podcasts that are largely populated by white, male comedians can be heavy on crass humor (which is fine, but can turn oppressively anti-woman/racist on a dime) and shoddier production value, which makes for a stress-filled listening experience (i.e. the opposite of what I'm looking for). Mystery Show hits that note of lightness and fun, but still delivers interesting, well-produced content. Obviously, you can do what you want because we make our own decisions in this world, but if you haven't yet listened to Mystery Show, I'd recommend skipping the pilot episode and going straight to Britney. Then, Source Code. I feel like starting things off with a bang, and then going back to the less punchy episodes once your loyalty is established is the way to go. L'Occtane Shower Oil. Real talk: how come no one ever told me that oil could be used in lieu of soap to cleanse the skin? Actually, that's a lie. Gregory Maguire told me. But truly, I thought he made that up. It turns out he didn't. It's totally a real thing, and it's awesome. I got this almond shower oil as a sample from Sephora in August, and now it's like I've banished the memory of what my showers were like before this amazing scented, soft-skin stuff came into my life. The New Jim Crow: Mass Incarceration in the Age of Colorblindness by Michelle Alexander. Here's what author, academic and social activist Cornel West says about Michelle Alexander's impeccably researched exploration of mass incarceration in the United States - "we are witnessing the unique union of a powerful and poignant text with a democratic awakening focused on the poor and vulnerable in American society....Once you read it, you have crossed the Rubicon and there is no return to sleepwalking." I agree with him. This book and its reality are important. A highly recommended read. Afterworlds by Scott Westerfeld. This book is a little bit meta in that it's as much about writing and publishing young adult novels as it is an actual YA story. The toughest challenge to writing a book with two parallel plots is making them equally compelling so that one doesn't drag behind the other. Scott Westerfeld, whose novels have given rise to many passionate YA genre fandoms and who has something to say both about YA stories and their industry, is in perfect fighting shape to take it on. A Game for Swallows: To Die, To Leave, To Return by Zeina Abirached. This stark and gorgeous, black and white graphic novel manages to achieve a scope that is paradoxically intimate and broad at the same time. It takes place almost entirely in an apartment building on one side of a divided Beirut during the civil war in Lebanon. Zeina Abirached's art is detailed and textured and sensory in a way that brings you in close and invites you to look out at the world from the windows of this building. One of my favorite favorites last year. Ex Machina. First of all, I just love writer/director Alex Garland so much. For whatever reason, I always seem to find myself reading his novels when I'm traveling. They're interesting and smart with little bits of levity, which makes them easy to read in transit. His movies are equally smart/funny/interesting in that he takes on established genres (like horror or sci-fi) that are traditionally pretty decadent and elaborate and strips them down until only the barest, most visceral elements are left. He's not afraid to start quiet and let things build. Ex Machina is a perfect example of this approach. It's not a perfect movie, but it was one of my favorites this year because I would always prefer to watch something that is reaching high and maybe falling slightly short than something that plays it safe and hits all its unambitious marks easily. Sidebar: the love I cherish for my movie boyfriend Oscar Isaac has totally been rewarded in the mushroom cloud of long overdue attention his career has gotten this year. Welcome to the party, everybody. John Wick. Javi and I watched this movie on Christmas Day in a double feature with an Oscar screener of Spotlight (Yeah. I know. The unintentional theme of our holiday movie viewing was EMOTIONAL JUSTICE.) John Wick is a stylized, anime and martial arts-inspired revenge movie directed by two former stuntmen, Chad Stahelski and David Leitch. I don't know why this fun fact fascinates me so much - maybe because one of the strengths of the movie is its visceral sense of physicality, which is an aspect of movie-making that stuntmen probably understand better than anyone. John Wick is brutal and bloody, but simultaneously quite beautiful in its execution. I loved it. Home. * Guys, for real, this movie is so sweet. True story: I watched Home in its entirety three times in a two day period with my three year old niece, and each time we both enjoyed it just as much if not more than the time before. We spent the whole rest of the week shutting each other in the closet and saying things like, "You cannot come into the out now" and then laughing hysterically. Good times. *Adapted from the middle grade novel, The True Meaning of Smekday by Adam Rex. Remember that episode of Family Ties where Alex has a transformative Ebeneezer Scrooge experience on Christmas Eve and then rushes out to buy presents for his family at 7-11, which is the only store open in the wee hours of Christmas morning? If Christmas is your thing (or you just enjoy a random end-of-year present fest), there are probably at least of few of you - some might call you procrastinators, but I'd say those in possession of full and busy lives - that are planning a similar eleventh hour dash for holiday gifts. Not to worry, I am all over this. The 2015 Book Gift Guide is here for you. And the good news is, there's still a few more days to hit up your local bookstore, so it probably won't come to gifting your loved ones with cough syrup and beef jerky like Jen and Mallory Keaton. Let's get our reading love on. This book is a lovely, lyrical Romeo-and-Juliet inspired story about two families of traveling performers who put on competing shows in the same Central California town once a year. It's a book that feels quite ageless in its appeal to me. I could see gifting this to adults and teens alike as the spirit moves you. Basically: Gorgeous metaphor-and-simile junkies, this book is for YOU. If you're a fan of Noelle's work on the cover (and truly awesome endpaper) of Rainbow Rowell's Fangirl, you'll love her edgier, more fanciful art in her National Book Award nominated graphic novel, Nimona (originally self-published as a webcomic). The thing I especially love here is the nuancing of lines between heroes and villains that happens in this story. The world could use more of that, I think. This was easily the most visually stunning graphic novel that I read this year. It tackles a lot of big, coming-of-age questions especially related to the complexities of learning to see one's parents as flawed people with their own struggles and darkness. The story is a touch meandering, but the images are so beautiful that I don't even care. Not one bit. This short novella by Yuri Herrera is my number one read of 2015. I loved it. The original Spanish prose is rhythmic and sensory, and the English translation by Lisa Dillman is carefully and artfully done (I also enjoyed reading the translator's afterword about her process and choices). It's a good train, guys. Get on it. Americanah is certainly a larger time commitment, but Adichie's prose is equally lovely and intimate and close. It's an interesting reading experience in that probably 75% of the book involves the central character sitting in a hair salon thinking about things that have already happened. To pull off something like that, I feel like the last 25% needs to really deliver to make the pay off worth it. It does and it is. When I was fourteen I checked out a copy of this book from the Quartz Hill Public Library (maybe it was the stark, 70s cover with the red background and white block letters that really sold me), and I still remember it as one of the favorite reading experiences of my young life. Admittedly, this pick is a little bit random, but there's something deeply fascinating about this story - Chess Champion Bobby Fischer's epic match against Boris Spassky in 1972 - and I feel like with the release of Pawn Sacrifice this year, it's earned a bit of current relevance again. Ever since we moved to Mexico's Central Coast last year, my Brooklyn-loving heart has so missed those cheap-and-flavorful Chinese food deliveries that were a twice or thrice a week ritual when we lived in Clinton Hill. To fill this dan dan noodle-shaped hole in my heart, I've resolved to try making some Chinese-inspired dishes at home. This cookbook is my best friend in that effort. It's interesting and accessible, with cool twists on more traditional faves (sitr-fried sweet peas, anyone? Smashed cucumbers with sesame paste? Yes, please). It's co-authored by James Beard Award-winning chef of the Mission Chinese Food restaurants, Danny Bowien, and editor of Lucky Peach, Chris Ying. If you haven't yet arrived at the Lucky Peach party, now is totally the time. Here's what I imagine happened: Momofuku restaurateur David Chang, New York Times food writer Peter Meehan and editor-in-chief Chris Ying sat down and said, "Let's put out the world's most awesome food magazine." And then they did it. Each issue is full of essays, art, photography and recipes structured around a theme and published quarterly. Truly, it's hard to imagine anyone in my life that wouldn't enjoy reading about, say, Abel Nabor Campos, the doughnut-making luchador of East LA. Happy reading! (and hopefully many calm and bright moments as the year comes to a close). Want more? You can hop over to my Book Love page for additional recommendations. ALSO: Penguin Random House has relaunched their #giveabook campaign this year, and has promised to donate one book to First Book for every use of the hashtag (up to 35,000) on twitter and instagram between now and December 24. In tribute to this love that has lasted long and stayed true, I started a tradition when I was in college called Muppet December. Every week in December, I watch one of the Muppet Christmas specials and use them as little moments of quiet in the last month of the year. 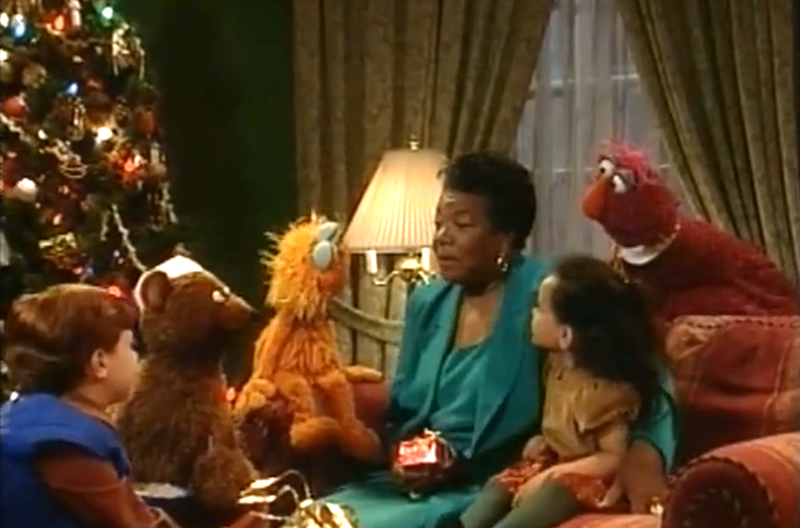 There are many to choose from - Christmas Eve on Sesame Street from 1979, A Muppet Family Christmas from 1987, and A Muppet Christmas Carol from 1992 are a few of my favorites. But this year, somehow, December has gone by quick and rapid fire. The days have been full with lots of weighty projects and questions that need attention and energy and take up big swaths of mental space. The Muppet holiday specials haven't made it into the schedule. This morning I woke up with a to do list. One of the long ones that doesn't bother with the smaller stuff and just goes right to the big, vaguely self-flagellating things like "figure out how to make the rest of my life work." I ran through the list in my head in the shower and by the time I got out, it felt like even the time it would take to get dressed and out the door to my coffee shop was time I didn't have. Me: Are you watching Elmo? JV: It's Elmo Saves Christmas. Pause while I absorbed the totally matter-of-fact tone he used when he said this, and my frenzied heart swelled that I married this person who would casually watch Elmo Saves Christmas in Spanish in the middle of the day. I got so, so lucky on that one. JV: Want to watch? I could start it over. Me: I gotta get to work. I kept up the crazy pace of my morning, shoving my computer into my bag and tossing my power cord and phone charger on top of it. Where are my headphones? Rosita: Hi Elmo. I have a Christmas present for you. Muppet December may have started a little late this year, but I think it's officially begun. *You can actually watch that entire episode here: Maria and Luis's Wedding. You're welcome. **Technically he said, "Estas galletas son para Santa Claus." Elmo does his own Spanish language dubbing. P.S. 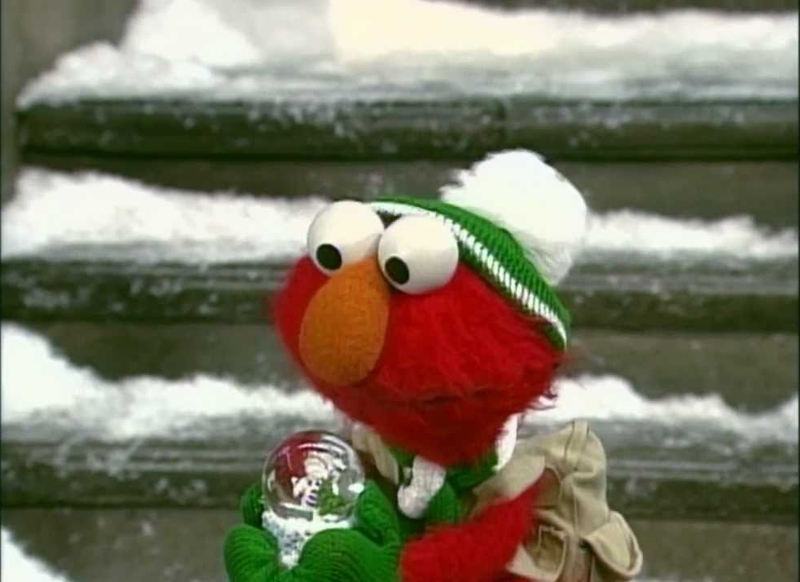 For a bit more on Muppet December, you can also check my holiday guest post for Idle Hands DC. I picked up Vanishing Girls by Lauren Oliver for two reasons. First, the title. Second, the cover, which is, I think, gorgeous and evocative, and marries with the title in that perfect book cover alchemy that means even without any other information about the book or its contents, I'm already on board. There are a lot of good things in this book - interesting relationships, moments of lightness to balance more weighty scenes, and the idea that most loss happens not all at once but a little at a time. It's a story that asks questions about what it means to be a girl in the world and the ways that we try to hold on to ourselves and each other as tightly as possible to stay visible and real and true. Here's where it went wrong for me though: Vanishing Girls, like many books, is structured around a critical twist - a reveal late in the game that changes the way we view everything that has come before it. Ideally, a plot twist would be satisfying both in its surprise and in its ability to illuminate and bring into focus the work we've done and the things we've learned as readers up to that point. The twist in Vanishing Girls is, in my opinion, obvious to the reader long before the protagonist is aware of it. And the thing is, it's an incredibly tedious experience to wait around for your narrator to figure out what you, the reader, already know; to have to watch the world of the story through a lens that you know is a false one. It makes you impatient and irritable with the protagonist. I have never been good at waiting. I like action. I like to be doing something. To this day, I still carry a book everywhere I go so that any time spent waiting is actually time spent reading - doing something that matters to me. One of the fundamental ways my husband and I are different is in our reactions to stress. When I feel stress thickening the air around me, my first instinct is always action - even if that action is just going for a run or pulling out my yoga mat. I like to be in motion. I like to feel my muscles moving in concert with each other, clearing the air for me to breathe. When arguments happen, I will never, if left to my own devices, leave the room until it's done. I don't want to calm down, I don't want to walk away and let the dust settle and then resume when we're all calmer. I want to act. My husband isn't like that. When he feels stress, his first instinct is to wait - to take a quiet moment by himself to think and calm down until the stress dissipates and he can face whatever storm is brewing with a clear mind. This ability to wait, to find stillness and perspective and then act with precision, is something that I deeply admire in him. One of the first things I ever noticed about Javi when we first met - working in a busy Times Square restaurant in the middle of the holiday rush - was his patience. Even in the midst of the chaos and frenzy of the kitchen where people were rushing around and speaking in tight, high-pitched voices, he never lost that ability to wait and hold his calm. Watching him from my spot behind the bar, I used to think of his patience as his armor, subtle and soft, but impenetrable. Table 12's order might be falling apart around him and everyone might be yelling and cursing and losing their minds, but stress couldn't find its way past his patience. It's the first thing that made me want to know him. Here's another thing I've learned about waiting from Javi - he doesn't wait long. He takes a moment, finds that stillness and lets it arm him in patience, but then he moves. He moves with speed and care, and gets things done. Patience isn't about waiting forever, it's about timing. In a story, it's about knowing when a moment of suspense - of waiting - will make the story more powerful. Waiting on characters for a little while is okay. Sometimes if we care for them enough, it's exciting to walk a step or two ahead, before they catch up and take over the leading again. But, if we wait too long, the waiting is transformed into tension, and the tension transformed not into fear as Coelho said, but indifference. We stop caring. Maybe that was, in the end, my problem with Vanishing Girls. The wait was just too long. *The cover art for Vanishing Girls was done by Anastasia Volkova with jacket design by Erin Fitzsimmons. Old Loves is my all-time favorite tumblr creation. Sometimes when the day has me twisted up and wound tight and headache-y, I spend a little time on the Old Loves feed, scrolling through photos and reading the captions until everything is a little looser and calmer and more pliant. Basically, the site is just a continuous scroll of photos of past celebrity relationships. The pictures are from magazine covers, red carpets, yearbooks, and newspapers. Sometimes there's a caption saying who and where and when. Occasionally, there's a quote or a little bit of context, but usually it's just the photos. I love the way it's less about how famous the people pictured are (shots of say, Andrew Keegan and Leann Rimes twinning in bedazzled shirts are given equal weight to those of Rita Hayworth and Orson Welles hanging out with Errol Flynn for example) or about how fleeting or long-standing or even non-existent the relationships were, but more about capturing the concept of relationship history. It has an interesting cumulative effect all collected together like this - the individual photos become tiny parts of a larger, more universal whole that feels allusive and oddly affecting - sort of like love locks on a bridge. It's impossible not to connect the photos to your own history as you scroll, like how Macaulay Culkin married Rachel Miner when I was a junior in high school and the idea of being sure about that kind of commitment at seventeen seemed so huge and foreign to me, or how when Johnny Depp was with Winona Ryder he said the most romantic thing he could imagine was eating the boogers out of someone's nose. In the context of the whole, even the Cruise/Cruz photos of 2001 kind of make me feel things. All images via Old Loves. "And whenever a few people would pass, she would shoot her eyes over at me really quick hoping I wouldn't see her looking. But I caught her every time, because I was looking at her too." There's this thing that happens sometimes when I'm reading a book, and the author lands a moment. It's usually not a big moment. Maybe one or two lines. It's small and it's quiet and it's stripped-down to almost nothing. It's not complicated. Maybe there's no adjectives involved. It just a moment that seeps in and feels deeply and wholly true. Something I can picture exactly and in full sensory detail without any of those details added. Something that can and does take less talented writers pages to describe. The thing with being great at these quiet, stripped-down moments is that you know when to just let them be. No explanation needed. No follow up summary of emotions. We get it, and it's enough. But, I think great writers also know when a quiet moment of truth works in tandem with a equally brief exposition in a jab-right cross that takes your head off. Here's another pair of lines from The Boy in the Black Suit. "It's amazing how you know when a room has light in it, even when you have your eyes closed. Light always wins." Sometimes you can let it lie. But sometimes, you can spell it out too - just a little - and watch the ref count it down on the mat. P.S. More Jason Reynolds here and here. "Love does not begin and end the way we seem to think it does...Love is a growing-up." During my first year at NYU, I signed up for a required creative workshop that happened to be a fiction writing class. The professor was a white guy in his late thirties - long and lean and vaguely disheveled - like a mix of ET-era Steven Spielberg and a King of Leon. 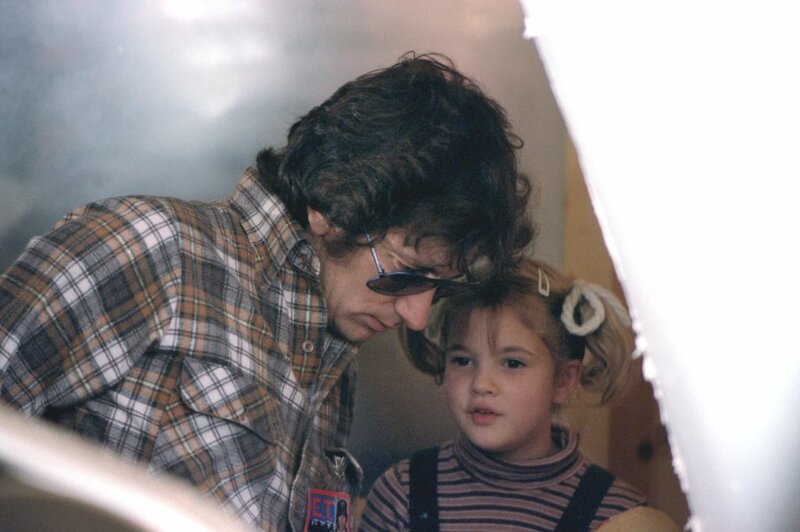 He was smart and unassuming and he sometimes said things to me like, "This story is good, but also crazy." He probably did some other introductory things to start the class, but the first thing I remember is him turning to the guy sitting next to me (an older man with a beard from Louisiana who gave me a strong Leonard Maltin vibe) and asking him to bring his favorite song - a song he loved - to play for us. He didn't explain why. The next week, the bearded man brought in a CD of Audra McDonald singing Adam Guettel's "How Glory Goes." I sat in the tiny classroom with no windows that used to be someone's office and listened to the song fill it up and expand it until the room felt enormous and vaulted. When the song finished we were all quiet, partly because the song was beautiful, but mostly because that one song told us more than we ever thought we would know about the bearded man. During the semester, the professor asked each of us for a song. He never gave a reason or commented on any of our song choices. * Once the week's song was finished, he just got on with class like nothing had happened. But looking back now, I think it was one of the most sage of all his lessons, perfect in its simplicity: The things you love say something about you, and taking time to identify them will make you a better writer. Or lawyer. Or architect. Or chef. Or property appraiser for the County of Los Angeles. In young adult fiction, the most foundational of narrative concepts is coming-of-age. The stories we write are all in part or in whole about what it means to grow up. There isn't a uniform definition or timeline for this. We are, all of us, complex and intricate and forever changing, and discovering who we are is a full time, life-long job. But, for me, growing up is about learning what it means to belong in your life. Sometimes it seems so much easier now to see truths that felt a little out of focus when I was younger, and I think it's because part of that belonging is growing to know yourself and your passions - the things you love - as fully as possible. When I start a new project, I make a list of movies that I love - movies that have stayed with me and resonated with me and held up to many, many repeat viewings. When I'm done, I look at the list and I write down all the connections I can see between the movies listed. Maybe they're all stories about unlikely relationships. Maybe they have bold visuals. Maybe they explore different kinds of desire. Maybe they're about characters whose identities are not easily defined. This list is my map - it shows me what I love, what light sources I'm drawn to and find myself growing toward, what weapons I use to arm myself to fight doubt, difficulty, disillusionment and hate. Sometimes, I change it up. In tribute to my NYU professor, I make a list of favorite songs instead of movies. Sometimes I use books. Sometimes instead of all-time favorites, I make a list of things that I can't stop thinking about in that particular season. What are the questions I can't stop asking, the things I can't get out of my head? If that NYU fiction workshop were today, what song would I bring to share? Like us, the things we love are always growing, deepening, and changing, so taking the time to make these lists and answer these questions keeps me current and relevant and connected to the inspiration that will move me forward in a project. It makes my writing both more buoyant and more grounded - the way singers simultaneously anchor and launch their voices with the richness of breath. But mostly, making these lists reminds me that I am a person who loves things. A person who can belong in her life, in her body, in her mind. The more rooted I am in that belonging, the more bold and still and true I can be in the work I do and the stories I choose to tell. *In case you were wondering, my song was Scream by Michael Jackson (ft. Janet). Just where I was at in 2004. It may be that you and I agree on the virtues of dark roast coffee and the intricate artistry of Swoon, but disagree on the watchability of Vin Diesel movies and the socio-political significance of Mary-Kate and Ashley Olsen. I'm cool with it though. We're all in this together. Want to see what I'm reading? “Maybe it was enough to have learned that love was the unexpected weapon, that it was the knife I’d needed to cut through the Kevlar I wore every day. Maybe this, I thought, was enough.” – A Very Large Expanse of Sea by Tahereh Mafi. Cover art by Rodrigo Corral Design. Have questions? Hit me with 'em.